Treffen Sie Ihren Reiseführer und Ihre kleine Gruppe von 10 gleichgesinnten Fotografen am frühen Abend im Zentrum von Stockholm. Bringen Sie Ihre DSLR- oder Kompaktkamera, Fernauslöser und Stativ mit, um die besten Chancen für fantastische Nachtaufnahmen zu haben. Beginnen Sie im angesagten Viertel Slussen, einem Viertel voller Nachtleben. perfekt für die Bewältigung von schlechten Lichtverhältnissen. Sprechen Sie mit der abnehmenden Dämmerung mit Ihrem professionellen Fotografenleitfaden über Kamerafunktionen und -techniken. Erfahren Sie mehr über Komposition, Beleuchtung und nehmen Sie an praktischen Übungen teil, um Ihr Verständnis zu verbessern. 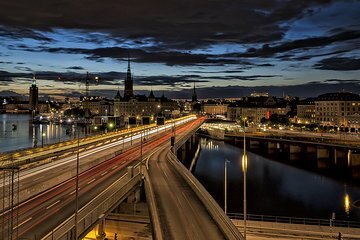 Fahren Sie weiter nach Gamla Stan, Stockholms Altstadt, um Aufnahmen von antiken Straßenlaternen und Kopfsteinpflasterstraßen zu erhalten. Dann besuchen Sie das Kungliga Slottet (Königspalast), das von Flutlicht umgeben ist und viele Möglichkeiten für kreative Nachtaufnahmen bietet. Steigen Sie zu einem Aussichtspunkt und fotografieren Sie die funkelnden Lichter der Stadt vor dem farbigen Himmel. Kehren Sie am Ende Ihrer Tour in die Innenstadt von Stockholm zurück, mit neuen fotografischen Fähigkeiten in der Tasche. Bitte beachten Sie: Die oben beschriebene Reihenfolge der Aktivitäten kann am Tag Ihrer Tour geändert werden. Our guide Patrik was enthusiastic, friendly and knowledgeable about the best locations for photos. We were novice photographers, and he provided lots of useful tips and encouragement for shooting with our manual settings. Highly recommended if you want to be a better photographer and/or to see some of beautiful Stockholm. This tour was not at all what I expected, but was a lot of fun. Honestly, I had signed up for it because I wanted to take some interesting night photographs of a beautiful city but, as a female traveling alone, who didn't know which neighborhoods were safe, and which not, wasn't about to go out photographing after dark. We met just at dusk, just two of us tourists, and the pro photographer, and we basically worked at taking pictures from several different vantage points with tripods and then did some work with experimental lights and the landscape of the city. I was initially rather dubious, as this is not the way I take pictures normally I had just got some pictures I loved of the people at the market stalls lit up in the early evening just before we all met up, taken by available light, handheld. However, the photographer guide was incredibly enthusiastic and helpful and the other person and I both learned a lot, and each got some good pictures that we would never have got without his suggestions and technical advice. You will need to have a tripod. Or be willing to rent one. They rented me one for 100 KR. I personally never use a tripod normally because many places I photograph won't allow them and I don't like the weight when traveling light. But to do the kinds of long exposure shots you will be doing, you will need one. Don't be intimidated about trying this tour if all you ever do is keep things on auto. The photographer will show you how to tweak things. But you should bring some kind of real camera. A cellphone can't do things justice. Even a great cellphone. Perhaps the photographer would disagree, but when taking pictures at night it helps to have a decent sized sensor to your camera. Cellphone camera sensors are tiny. On the other hand, I did think that we could have gone to a couple more sites to photograph, and maybe slightly more varied ones. I personally like places with activity and people doing things. It might be nice if they added a half hour at something like a fairground or some such and gave one advice on how to get THOSE kinds of nighttime shots. Stockholm has a famous amusement park so that might be a possibility. Even if simply near it, to get maybe views of the rides swooshing thru the night sky. Or driven one to a couple of the major historic landmarks I got really pretty shots of some swooshing lit up trains and railroad tracks, but I would really rather have had some of a spotlit palace or two, or some statues--call me old fashioned!. However, overall, the concept of honing ones skills and seeing things from a different point of view is a good one. And our photographer was absolutely great. I don't think I've yet met one back home who was as generous with advice/tips and techniques his own work on Instagram is fantastic. This was a good trip. The venues appear to have been thoughtfully selected with one exception. W stopped to shoot between buildings, across a body of water at an amusement part. It would have presented a good opportunity for interesting long exposure photos of various illuminated rides against the night sky and reflecting off the water except that the park was closed. There really was nothing of interest to photograph. At least in my opinion. The other venues were very good and there was some fun with light painting as well. Max, the instructor was knowledgeable and helpful. Overall, a good trip that allowed me to get some good photos. Great tour with a helpful guide. 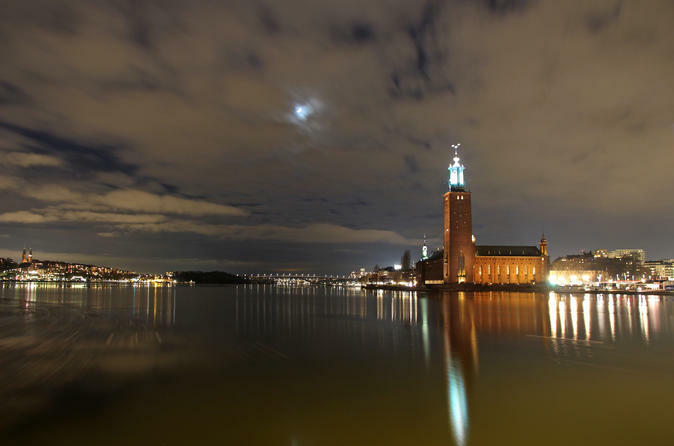 We loved our Stockholm by Night: Photography Walking Tour. It was snowing the evening of our tour and all of the other participants canceled, so it was just my husband and myself with our guide, Patrick. Although he could have canceled our tour, Patrick still met us and really took the time to show us all of the beauty Stockholm has to offer at night. Patrick was clearly very knowledgeable not only about photography, but also about Stockholm and it's history. It seemed like he knew some bit of history or folklore about every alley we passed. Patrick was so friendly and easygoing, he made us feel very comfortable even though we are photograph novices. I would highly recommend this tour to anyone visiting Stockholm! Excellent tour of Stockholm by night. I learned quite a bit from Patrik.